Missions are unlocked by quest progression. They're a self contained instance, separate from the rest of the universe, which players can teleport to via SAIL on their ship. Most missions reset when players leave them, and have checkpoints for quick return when dying. In Survival, the Hunger meter will not deplete. The checkpoints are the satellite dish machinery that activates when you approach the final boss's room. 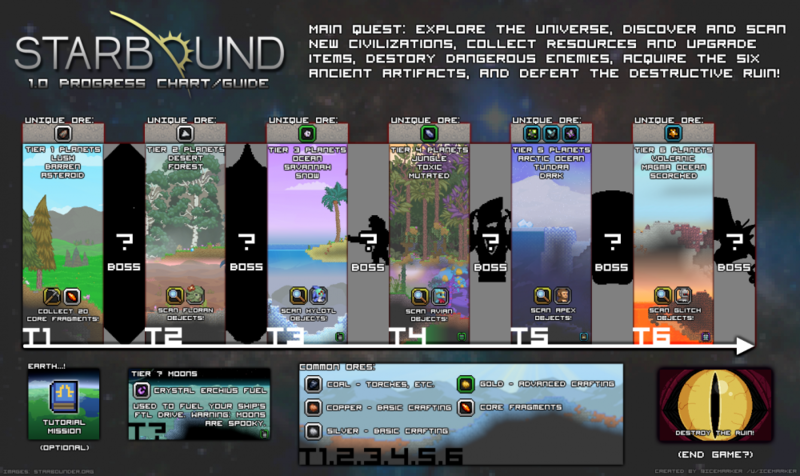 There are six race themed missions in Starbound, each of which unlocks an artifact for the final mission. After completing each mission a mission specific character will then join players at the Outpost, near Esther, the woman who gives the quests. Each mission has unique items to be found and ends with a boss encounter. It is recommended that you bookmark each race's settlement so you can return there quickly for their scan quest later on, if you find any while exploring. Flags are useful for this purpose and work even if you leave that solar system. Here is a visual guide created by /u/icemarker at Reddit. This page was last modified on 6 August 2017, at 14:27.